Included in the "David Cronenberg's Collection volume 1". A clean clear transfer though the source print used is rather marked throughout but this is not too distracting. The front cover text is in English (basically the feature title) with the rear cover having notes in Japanese only plus the cast, crew credits & the "Cronenberg Filmography" in Japanese & English. 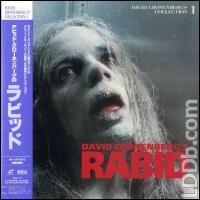 This title (Rabid) is first of the Japanese releases from the "DAVID CRONENBERG'S COLLECTION" with the second release being Shivers on [SHLY-40] & there appear to have been no further titles issues under the "DAVID CRONENBERG'S COLLECTION" heading.